Should government support artistic and cultural expression? 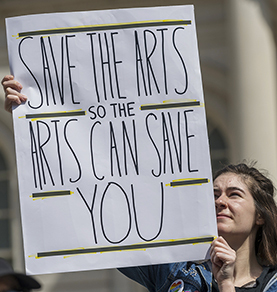 The Trump administration wants to end federal funding for the National Endowment for the Arts, the Corporation for Public Broadcasting and other cultural agencies. While those agencies receive only a fraction of the federal budget, the administration says other needs are more pressing and that government arts spending represents a wealth transfer from poorer to richer citizens. The proposal has revived an argument that raged during the “culture wars” of the 1980s and '90s, when conservatives and liberals sparred over whether the government has a role in supporting the arts and whether federal money should help pay for art that some deem offensive. Funding advocates say exposure to the arts helps students perform better in school and that theaters, symphonies and museums help bolster local economies. The arts continue to have powerful supporters, including local politicians and civic leaders who serve on arts boards in nearly every congressional district. Nonetheless, some cash-strapped state and local governments are cutting school and public arts programs.